You don’t see it expressed too often. Not in polite Auburn company, anyway. But occasionally, you’ll see an Auburn fan respond to failure in a sport that isn’t football–and as we know, we’ve seen plenty of failure the last several years on the baseball diamond and basketball court–with a shrug. “It’s not football,” they’ll say. “Who really cares? How many days ’til kickoff, again?” The past few years, I’d almost come to have some level of sympathy for that position. Sure, it would have been nice to have a winning hoops teams and a winning baseball team. But we were doing OK without them … right? Creede Simpson deserved to have that chance, too, and if he took advantage of it in the grandest style possible, we shouldn’t forget that it’s been an entire season of phenomenal baseball (and phenomenal baseball coaching by John Pawlowski) that got him and his team to that point. 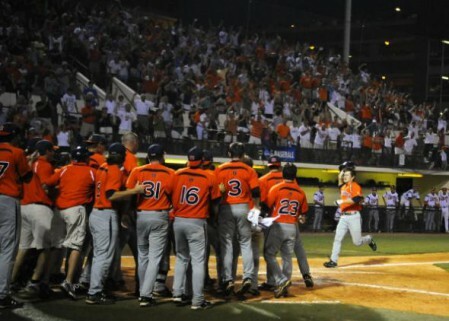 It’s been the kind of season that we didn’t realize how badly we’d missed until we were in the middle of it … or maybe not even until last night, when Simpson connected and Plainsman Park shook and we all remembered that failure is never something to be shrugged at. Auburn wasn’t just missing out on SEC tournament appearances and NCAA brackets and numbers in the win-loss column; they were missing out on Creede Simpson keeping the season alive with a two-out home run in the ninth on a 1-2 pitch. Here’s to hoping last night was just the start of a long period of not missing out when it comes to Auburn baseball. — Admittedly, I’m relying on other people’s descriptions of the moment, since I was neither there in person (obviously) nor watching on TV (no such thing this time) nor even listening on the radio. I was following on Livetracker–sigh–but even so, you’d be surprised how freaking happy you can be watching the little cartoon baseball fly over the cartoon wall and the little cartoon scoreboard light up with HOME RUN! Nonetheless, all those of you who were there: I was and remain deeply, deeply envious. — Auburn’s out of starters, but I might think the advantage swings to the home Tigers anyway at this point, since neither team is exactly going to be putting a lights-out guy on the hill in the first. The deep bullpens are going to figure heavily and there should be a lot of scoring. Deep bullpens are typically the kinds of pitchers Auburn’s lineup has chewed up and spit out, and the Tigers have always been very comfortable in high-scoring games. Like yesterday’s, for instance. Then again, I thought the exact same thing before the Ole Miss meeting in Hoover, and we all remember how that turned out … and, of course, the Rebels had vastly less firepower than Clemson does. — Maybe the Pythag was a hair too bullish on Auburn–our Tigers were one of only three top seeds to slip into the loser’s bracket (Coastal Carolina and Cal-State Fullerton were the others), and very nearly the only one to fail to make it to a championship game–but at least it was right about Ole Miss. The Rebels were one of only two SEC teams to be eliminated before the championship round, and at least LSU went out to a long-time baseball power in UC-Irvine. Ole Miss was eliminated by St. John’s, which you may know as 1. a Big East school 2. located in New York City. — War Eagle, guys. Let’s get it done today. I didn’t hear it live either, but felt my heart swell all the same when I listened. Hate to be the one to tell you, but if you were watching on gametracker, you could’ve been watching the video feed. Click “Live Video”. It’s been free all weekend. It took a lot for me to not get up drive down after the game and set up a tent in front of the ticket office. Damn you real job! When’s kickoff? Kidding of course. Zach, thanks, but my Internet can’t handle it. I’m on DSL in the middle of nowhere. I can’t “stream” YouTube videos, much less live video. Livetracker generally stays several plays behind real life. last PM. I watched the last 5 innings (starting with the Clemson 7 run inning)-college baseball is not for the faint of hear what with the aluminum bats and such. I hate to admit that I haven’t been near the baseball stadium since the mid 70’s but that looks like a really cool setup with the green monster and all. Would be fun to catch a game sometime. It was bedlam in the parking deck, I can attest to that. It was that same overwhelming and indescribable euphoria that you can feel in the tips of your toes. The stuff usually reserved for Jordan-Hare. All one would need is the slightest grasp of this colossal and powerful moment, and it would be enough to overwhelm them. That’s why we sports fans are sports fans. And that’s why, like you say, we need more of it outside the gridiron. But here’s something you might have missed by not being in the stadium (or — uhh — the parking deck) — Trooper Taylor was there, towel and all. He had a nice seat, second row near home plate on the first base line. He was pretty active and getting the crowd pumped up at the beginning, but took a seat and didn’t want to steal anybody’s thunder once it got going. According to Pawlowski on the radio show after the game, he gave the team a pump up speech before the game. (And added that the football team is going to get a lot of top-ranked recruiting classes with this guy making speeches like that to recruits.) I don’t know if he stayed until the end. Poor Troop if he didn’t. A colleague of mine (AU grad from the 90s!! small world) and I were discussing the game against FSU that sent us to the world series (late 90s) on Friday and then this happened on Sunday. Michiana, I’m with Frontier Communications in the middle of the federal Navajo reservation. I’ve tried, believe me. Didn’t last night, though … guess I can give it a whirl tonight. Nothing to lose. Except that if it does work, I’ll never forgive myself for not trying it a night earlier. AO, a couple of people commented on Twitter that Troop was there. So awesome. I know a few of the Tubby crew attended baseball games from time to time, but how many would have made the effort to get the crowd going or offer a speech to the team? Just had to say this. I have been to easily 150+ games at Plainsman Park and more than 1,500 baseball games in my life (I’m only 26). That the best game I can remember seeing if you include the magnitude of what it meant, and I’ve seen Eric Brandon’s perfect game, Ubaldo Jimenez’s no-hitter this year, several big league cycles, and major league playoff games. Plus, that was the absolute loudest I have EVER heard Plainsman Park. It makes me wish that crowd was there all the time, not just for playoff baseball. Baseball is the sport I follow most closely at Auburn after the boys on the gridiron, and quite honestly is my favorite b/c I met my best friends at the park during undergrad. Three of us have been to every home game this year and traveled to Oxford for the West Division championship series a few weeks ago and I can tell you that tears were shed between us, if only because I haven’t lived here in several years and this was our first season back together. It feels like “our” team, since everyone goes to football, but not as many follow baseball religiously. I’m rarely speechless (hell, I used to get paid to talk about baseball for a living) but last night left me so. Thank you Creede, Austin, Slade, Freddy, JB, Hunter, KP, and the many others I’m leaving off of this for this season. It means more than you will ever know. It’s interesting, because you would think that basketball would be more Trooper Taylor’s scene. Hmm… It’s almost like this guy just cares for the well-being of the university. Imagine that. It’s crazy; We’re just hours away from game time again. I need some more time to bask in the victory for a while! Of disparaging other sports – namely basketball. But we were good at baseball when I was there. I caught the tail-end of the Baird administration and got to see Gabe Gross and Tim Hudson. They placed 6th in the CWS my freshman year. For some time, I have lamented the decline of AU baseball. And the more I see of Mr. Barbee, I think I’ll have to get on the basketball bandwagon too I guess. Brad, thanks for that comment. I’ll admit that as much as I enjoyed last night ,I know it meant way more to people like you and PPL’s Kevin who were living and dying with this team even before it became what it is today. I’ll give the radio button a try tonight. That should work, actually.